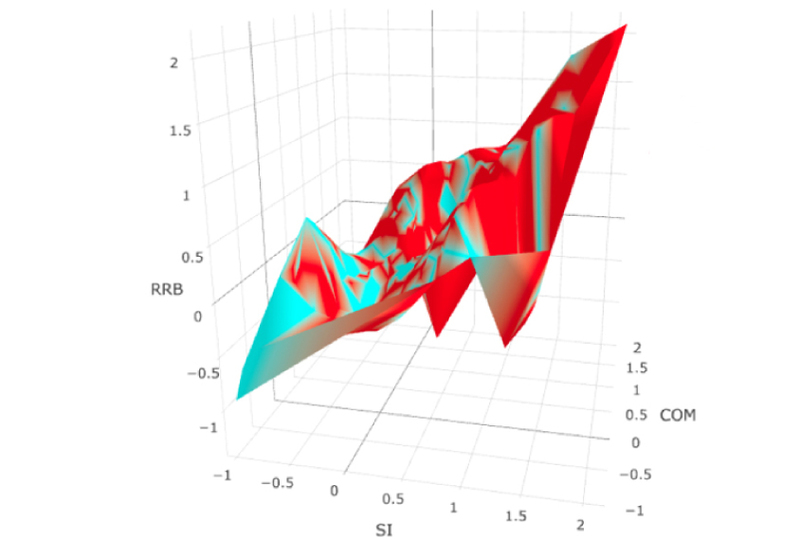 Third dimension: People with autism (red) and those without (blue) show three traits related to the condition to varying degrees. Three distinct categories of traits best characterize autism, according to a study of more than 6,000 children1. Children with autism or other conditions fall on a spectrum of ability in each of these categories — problems with social interactions, communication difficulties and repetitive behaviors, the results suggest. And autistic children tend to be at one end of each spectrum. The new findings support the hypothesis that each of these autism traits is inherited independently. The analysis pits the model alongside 43 other possibilities. The other models vary in the number of categories of traits and in how people with and without autism measure on each one. The results of this creative statistical analysis align with how autism presents in the clinic, says James McPartland, associate professor of child psychology and psychiatry at Yale University, who was not involved in the study. “You need to understand [autism] in terms of an individual person’s profile of strengths and vulnerabilities,” McPartland says. Lerner’s team analyzed parents’ responses on a 12-item questionnaire called the Child and Adolescent Symptom Inventory-4R. They looked at responses from parents of 3,825 individuals, ages 6 to 22. The participants had been referred to a clinic for possible developmental disability or a psychiatric issue. They are diagnosed with a range of conditions; 1,043 have autism. The team then clustered responses that seemed to go together. For example, parents who say their child relates to others in an unusual way also tend to say the child has difficulty playing with other children, but not that the child speaks in an odd way. The analysis suggests that traits in one category, such as communication, tend to cluster together rather than with those in the other two categories. This pattern is true for autism and for other conditions, including attention deficit hyperactivity disorder and learning disabilities. The researchers confirmed the pattern in another group of 2,503 children referred for psychiatric conditions. “Conceptually, it may be better to think of communication deficits, although they do involve social interactions, as a distinct group of autism features,” says co-lead researcher Kenneth Gadow, professor of psychiatry and behavioral health at Stony Brook University. “These scores are not truly independent, and that is one of the most important aspects of autism,” Lord says. Others say the study’s findings are limited by the data. The questionnaire is designed to detect only the three traits it flagged, which makes the analysis circular, says Stephen Kanne, professor of pediatric neuropsychology at the University of Missouri in Columbia, who was not involved in the study. The researchers counter this criticism, however: If the initial questionnaire had not addressed each of these traits, Gadow says, it would not have been possible to detect whether they are linked. The researchers also did not include children in the general population, McPartland notes. And they did not include other types of traits, such as sensory issues, in their analysis. The results appeared in October in the Journal of the American Academy of Child and Adolescent Psychiatry. In another study, published this month, the same team found that children with autism are more likely to have 1 or more of 13 atypical communication characteristics than are children with other conditions. These characteristics include repeating words or phrases, stammering and reversing pronouns2. The researchers are trying to use their statistical approach to identify subgroups of children with autism.